In early-2015 Jasco, a company that delivers end-to-end best-of-breed solutions across the entire ICT, Power, Enterprise and Security value chains, realised the opportunity to become a leader in the field of renewable energy, harnessing its expertise on a solar project at its own head office complex: Jasco Park. Located in Midrand, north of Johannesburg, Jasco Park houses over 250 of the firm’s staff, as well as a data centre and various other amenities. The vision was to use solar electricity to power much of the Campus energy needs, to cut down on the costs of traditional power, reduce dependency on the national grid, and gain valuable insights into clean energy deployments. An additional upside of this project is that Jasco is able to use their head office as a reference site and showcase in order to better serve clients. 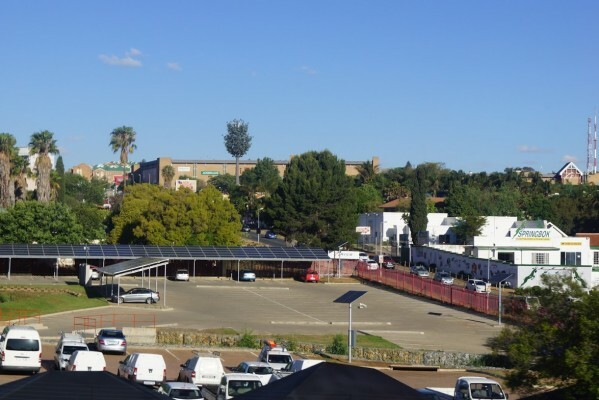 The team began the installation of a solar carport system in April 2015, leveraging the real estate available above the carports used by staff and visitors. Phase 1 of the project involved the installation of 53kWp of solar panels, accompanied by two 25kW inverters to generate up to 50kW AC power during peak generation periods. “Kevin Norris, Consulting Solutions Architect for Jasco Power & Energy explains that due to the Westerly orientation of the phase one project, as a result of the existing carport layout, peak solar generation occurred in the early afternoon, matching the peak load profile of the Jasco campus, which occurred as a result of commercial operations and air conditioning loads. 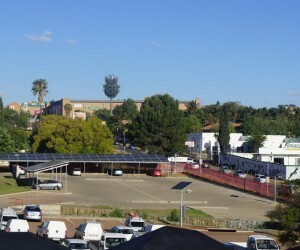 Phase 2 saw the additional installation of a brand new solar carport system in the Northern section of the Jasco campus. This upgrade saw the total PV generation of the Jasco Campus increase to 150kWp with an increase in invertor output power to 125kW AC. The solar system remains ‘tied’ to the national grid, which enables seamless consumption between both the traditional power source and the new solar generation. Energy needs are primarily served by solar power and supported by the national grid where needed. In this way, Norris explains that in situations such as power outages, the solar system is not a backup to traditional power, but rather a complementary source of clean energy. In the event of power cuts, Jasco Park still fails-over to generators, to keep the datacentre operations running and ensure staff are still able to work. “Throughout the process, we used this project as an opportunity to create blueprints for our Renewable Energy programmes within our clients’ environments,” notes Dave Smith, Managing Director of Jasco’s Renewable Energy Division. “Our vision for this project is to showcase the opportunities presented by utilising solar energy, and demonstrate tangibly to our clients and encourage other corporates to embrace clean energy,” adds Norris. To this end, Jasco considered the full ambit of civil engineering and construction needs. The team settled on a cantilever system which doesn't’ require any unsightly poles in the front, and ensures that cars cannot accidently bump into the structures. This design also creates a more aesthetic, futuristic feel to staff and visitors as they’re welcomed into Jasco. By the end of the 2nd phase, the team had effectively matched the campus demand with a reliable supply of new, clean energy. As a result of this initiative, Jasco has reduced its maximum demand by 27% and reduced its electrical consumption from the Utility by 33%. Both these reductions have resulted in a significant financial savings, even at today’s tariff structure. If you project these savings going forward with Eskom’s current request to increase electricity costs by 20% per annum, you can see how Jasco has largely insulated itself against future tariff price shocks. “Overall, we’ve reduced the carbon footprint by 50%,” reports Smith, adding that the payback timeframe is pegged at 5-6 years, but that if national energy tariffs and carbon taxes rise higher than inflation, that timeframe may be brought even further forward. At certain periods of time such as at weekends, Jasco Park actually becomes a net exporter of energy - now selling energy back to the national grid and creating a new, growing revenue stream. “Most importantly it has also empowered us to have the right client conversations, as we clearly show them the positive impact of solar - not just from a business perspective, but more broadly in addressing macroeconomic and climate change issues,” says Smith. From their experiences with Jasco Park, the firm’s Power Solutions & Renewable Energy team is able to focus on the engineering, procurement and construction requirements for solar energy systems in high-end residential, commercial and small-scale Utility projects. Renewable energy - which encompasses primarily hydroelectricity, wind, solar and geothermal energy - now accounts for roughly 8% of total global energy generation*. As South Africa looks towards a future of electricity tariff hikes, the advent of carbon tax, and a corresponding decline in the costs of solar, Smith says a number of forces are converging to stimulate the growth of solar energy in corporate South Africa.